As we all (older people) know, its scary how fast the years pass by. So here we are, and a year has already passed since I took the leap to launch the blog and my official portfolio. I launched my portfolio in the recovery from the strong sell-off in early 2016. The next six months would be very easy to a be long only investor, with world markets drumming upwards and quickly shaking off the Brexit event. After that it has been more of a mixed bag for world markets, naturally with a lot of focus on Donald Trump. From the get-go writing this blog I knew it would be a challenge to keep up the pace. I didn’t want this to be something that flared up for six months and then died down. My main goal the whole time has been to keep this page running for one simple reason, to build a credible track-record of my investments. I want to keep building this track-record over a long enough period, to be able to evaluate if I would be suitable to invest money professionally, for myself and perhaps for others. I expect this to be a very long process, perhaps around 10 years. From time to time it is hard to motivate myself to sit and research companies or just in general read, to come up with ideas or understand something new. It is a fun process, but only when you do not feel stressed by other things. This has been a struggle from time to time, especially during end of last year. It is after all a hobby and I have many other good things in my life, a full time job for example. The type of content I produce has also shifted somewhat. In the beginning it was more of what I already know and could teach you readers, later it has been focused on what I do not know, which I write to develop myself. I think this makes more sense for me, although I know of many popular blogs that write a ton of material to educate their readers. I could do that, but since my purpose is to build my portfolio track-record as successfully as possible, that will be the focus. Finally, a clarification. You might wonder why I never post a company analysis where I conclude the company is not worth buying? The reason is that I live and operate in a region where people actually are banned from the industry or sued for making “false” claims which brings down the stock price of companies. I do my research based of public information, the best I can and have time for. But I do not want to have any risk of ending up in this situation. Of course I do analyse a lot of companies that do not end up in my portfolio. Unfortunately you will not see me posting on those (in any great detail at least) in the future either. The other reason for this is that it saves me time, that I do not have to write a long post about a company that I already discarded as an investment. The obvious downside is that I haven’t recorded my thoughts clearly and the stock could be worth revisiting at a later stage. We especially learn from our mistakes, I think we all know that. So let’s have a look at what has gone wrong for me during this year. Looking at the current portfolio there is not much that has gone terrible wrong. 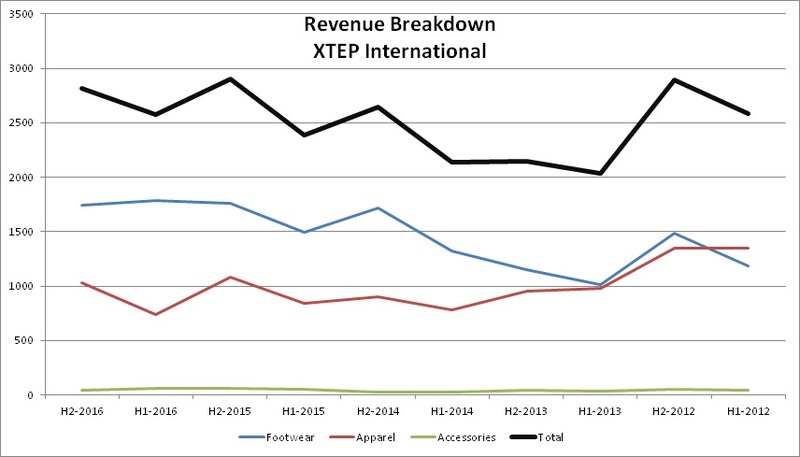 The shoe company Xtep International came in with a weak report, mostly related to the Kids shoe business. Here one can say that since I’m not a user of their products and I never visited one of their stores (I tried but they were too far away from Shanghai city center), I obviously don’t know the brand well. I have only looked at company figures and online how popular their products seem to be. Buying consumer brand companies without knowing the products might add unnecessary risky, which is obvious for other. I try to hold on to the companies that does well, so to say “let the winners run and cut losers short”, this leads me to the next topic. To find my larger mistakes we should instead venture to what I already held but decided to sell. Before we start talking about specific stocks one can notice that I had fairly significant portfolio turnover. Out of my starting 13 stocks, 8 have been sold (although 1, SAFT, was bought by Total). This is in my opinion too high and something I need to correct, there is no point in such a stable market to be switching the portfolio so quickly. A portfolio turnover around 50% per year, would perhaps be OK, but preferably I would want to come down towards 30-40% in a normal market. One can also notice NetEase as a big positive outlier, which was one of my larger holdings with a tremendous run. In general I have a tendency of selling companies to cut my losses. Looking at the 4 stocks I sold at a loss, it seems to have been a bad decision on all occasions. All of them has positive performance afterwards. Here we find my two biggest mistakes, Highpower International and Zhengtong Auto. Highpower I was very well aware that the stock might bounce after I sell. It’s after all a stock with thin liqudity and very volatile stock price. So it’s not so painful, although still bitter to see the stock rally after I sell. In terms of taking profits and selling winners, the result is more mixed, in several cases I have managed to sell a stock at a peak. I have to confess I am somewhat of a chart-follower. I watched charts for so many years I tend to (believe) have some feeling of when a stock is weak or is going to correct soon. It’s not all about charts either, it’s also me believing in mean reversion in more or less everything related to financial markets. 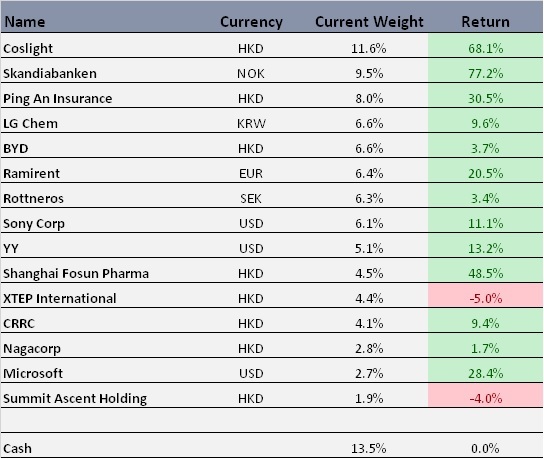 Two of the cases where it has been wrong to sell winners, are lower risk companies, SAS Preference and Yuexiu Transport, which both have very high dividend yields and kind of slowly compound upwards. But my general strategy is to let my winners run. So it what cases do I then sell a company that had a nice run and in what cases do I just ride out for the long run? That is a good question that I’m struggling with myself. I probably need to more clearly define what stocks I no matter what own for the very long term, then I’m at least not allowed to sell the full holding, just because the performance is very good in a short time. Looking at normal portfolio stats my returns looks impressive. My risk figures are somewhere in-between MSCI World and the Hang Seng index. But my return figures are much better, indicating a fairly significant amount of alpha has been created. 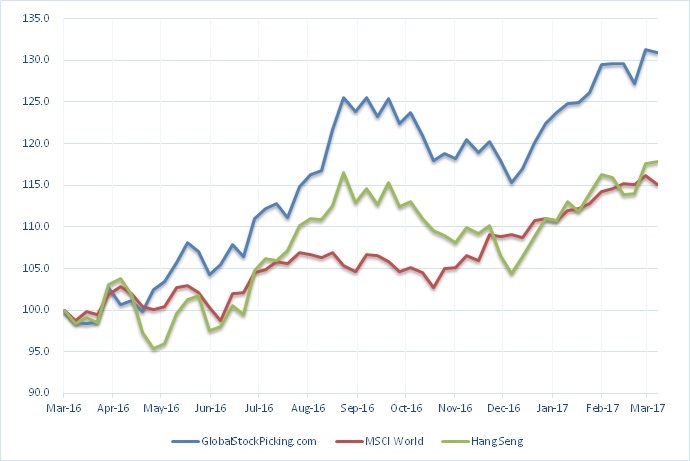 Return wise, the correlation indicates that I seem to be closer to Hang Seng than MSCI World, which is maybe a bit strange considering that I call my blog Global Stock Picking. A part of this portfolio tilt I motivate by that I find valuations on stocks with China exposure to be among the lowest I have been able to find. Another reason is that I’m closer to the region and therefor have a tendency of reading more general news that give my ideas for stocks to follow-up on. With my portfolio being concentrated to around 15 holdings, looking just at standard deviation, might not tell the whole picture of the risks in the portfolio. 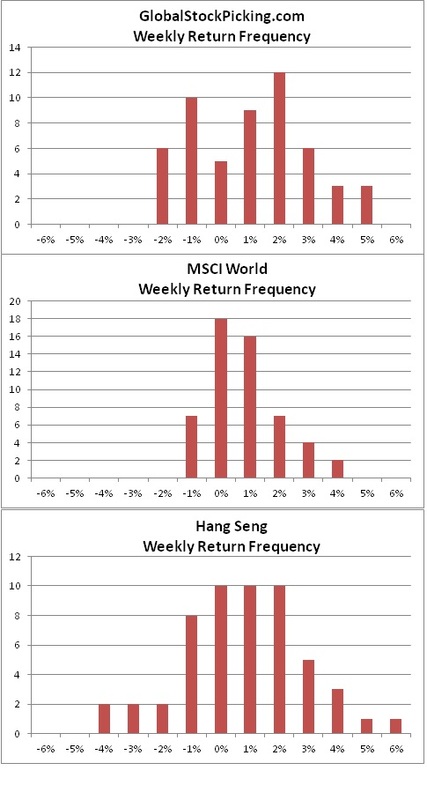 As we can see from the weekly return histograms above we can see that MSCI World and Hang Seng has a weekly return profile similar to a normal distribution. 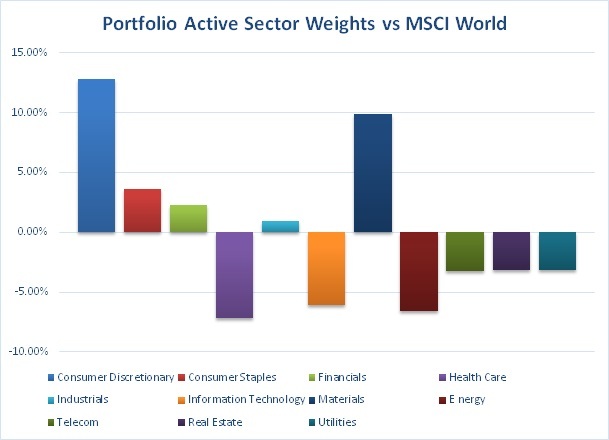 We also understand why MSCI World has 9% vol and Hang Seng has 15%. The weekly return distribution for my portfolio looks.. ..different. It’s rather inverted from a normal distribution. During this year I have managed to skew the distribution towards the positive side. In another market environment and making some wrong calls one could imagine that a portfolio with this return characteristic could turn somewhat ugly. But partly this is the price you pay with a concentrated portfolio. Here I must say I’m quite satisfied, being a single person running a portfolio, it is not easy to have expertise to invest in all sectors. 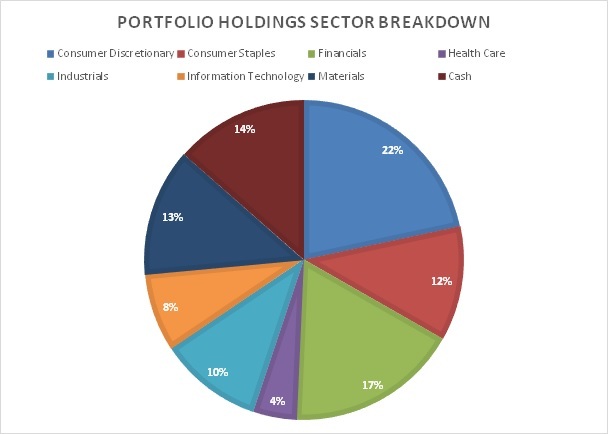 With only around 15 holdings in the portfolio one could not really expect a better spread among sectors. Professional fund managers often minimize sector bets to less than 10-15% active weights, but they usually have much broader portfolios with at least 40-50 holdings for Global Portfolio. I will try to continue to keep my portfolio as sector diversified as now. 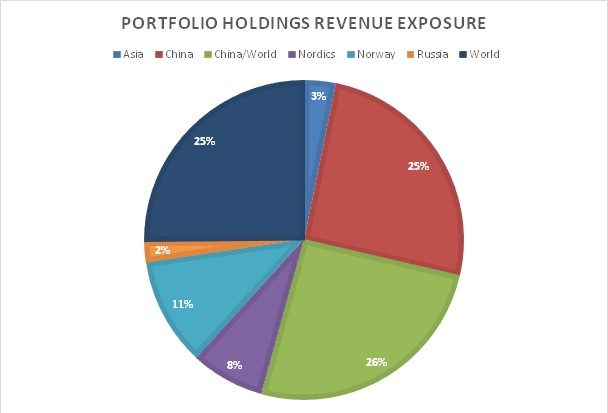 As we already have seen in the correlation with Hang Seng, here is the Achilles heel of the portfolio.Way too much of my companies revenue is dependent on China. 25% is pure China exposure and another 26% are companies with large China exposure, but are also selling worldwide (this is mainly my battery companies). Property prices in China are crazy and all Chinese that can afford it are speculating widely with borrowed money. As soon as the market starts to wobble the government steps in, so it might be allowed to continue for many more years, but as some point a reckoning day must come. And that day, even though I found companies with great prospects, short term I will surely suffer greatly return-wise. Here I must find a reasonable balance and right now one might argue that my global stock portfolio is not really balanced. You don’t get my kind of returns in a year without taking risks (deviating from bench) and being somewhat lucky. How much it was clever risk taking and how much luck, that will always be impossible to judge. The risks I have taken are related to a few sectors and exposure on China. Within these two exposure groups I have managed to pick stocks that outperformed. The main contributors in these two groups are NetEase (Chinese gaming), Coslight Technology (battery producer) and Shanghai Fosun Pharmaceutical (Pharma holding company). On top of that I managed to pick up some Nordic bank exposure (Skandiabanken) just when banks stocks started to rally. I picked one of the strongest performers of all, as well in the country where the currency (NOK) since then has strengthened against USD. I would attribute a higher percentage of skill in identifying NetEase and Coslight and more luck in the case of Shanghai Fosun and Skandiabanken, since my analysis on the two latter was much more shallow. I will work actively on reducing my China dependency in the portfolio. I will try to reduce my portfolio turnover, preferably max 6 new stocks in the portfolio over a 12 month period. I should really think twice before I sell a stock just because the performance has been bad. My hit-rate on these trades is awful. I should probably keep selling or maybe even better, reducing the size in stocks that had a very strong run, my hit-rate on these trades is very high. But having said that the most important is the long term and I should mark down what stocks I’m not allowed to sell on short term speculation, risking losing out owning the stock for the long term. Thank you for reading and I’m very happy with your contributions in the comments section!